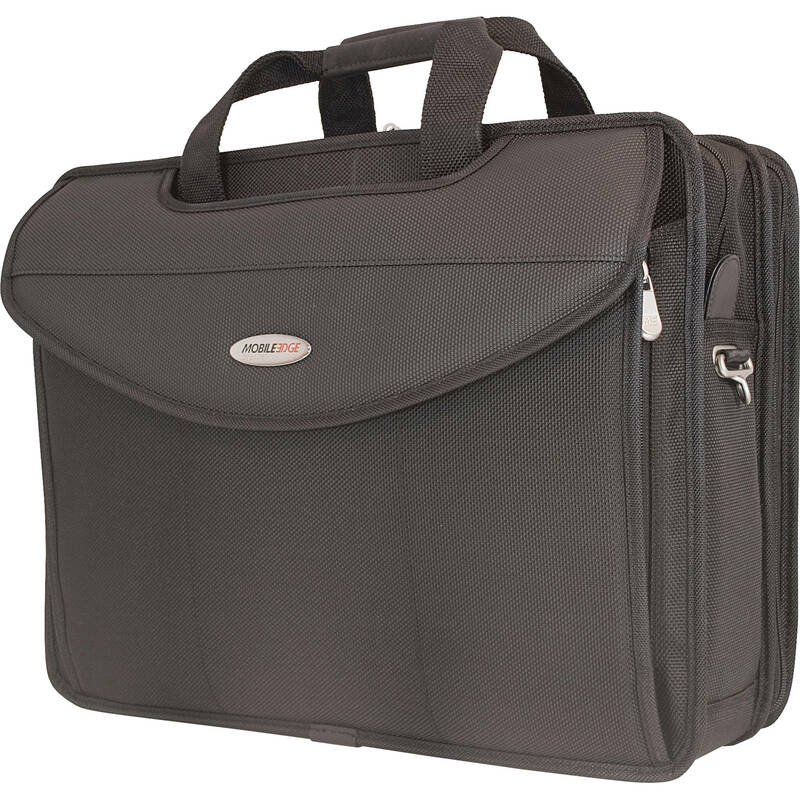 The black Premium V-Load - 17" laptop briefcase from Mobile Edge is designed to accommodate many current 17.3' (43.9 cm) laptops. This is an extremely durable and well-built case made from solid 2520D ballistic nylon, strong fittings and buffered by gussets at the seams that reinforce an already exceptionally strong case. The Premium-V-Load contains Mobile's exclusive Safety Cell technology. This is a separate computer sleeve, placed in the center of the bag, that protects your laptop against accidental drops. It is located with compartments on either side for even more cushioning. Safety Cell Computer Protection System employs Multi-Compression Technology (CT). The Safety Cell design offers what Mobile describes as "object-deceleration" that allows the multiple independent foam cells within the system to more effectively absorb impact if your case is dropped. It also incorporates a Wireless Security Shield that is designed to protect against hackers and scammers while you're using your computer in public. In addition to the Safety Cell and Security Shield, this case contains a Bungee Comfort System that moves in rhythm with your body while walking. This helps minimize the stress of the bag swinging at your side or rubbing against your body. Within the bag there is more than ample space in the expanding file section for collateral material, binders and documents. A rear pocket is available for quick access to a ticket, boarding pass or passport. The spacious interior will also hold everything from CDs, PDAs and cell phone to other small electronic devices, cables or adapters. This is a rugged top-loading bag carried by an elastic shoulder strap or two top carry straps. Backed by Mobile's lifetime warranty against defects, it's a serious bag at a reasonable price point for anyone who wants maximum for their laptop while also having sufficient space for supporting equipment. Box Dimensions (LxWxH) 18.7 x 13.8 x 3.8"